A number of popular Cape Cod beaches have been closed after multiple reports of sharks, including deadly great whites, swimming not far from the coast. The closure is just the latest twist in an unusually shark-infested Cape Cod summer. A string of beaches off the shore of Chatham, Massachusetts were shut down indefinitely on Wednesday, making it likely they will be closed throughout the Labor Day weekend. Fishermen and tourists have reported an unexpectedly high number of sharks in the Atlantic off the Cape Cod coast, some less than 20 feet offshore. 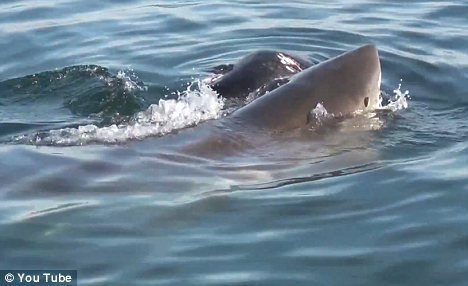 Last week, a vacationing family filmed footage of a great white shark feeding on a seal just a few feet away from their boat. And in July, a man was bitten in the leg by a shark while surfing off Ballston Beach. This weekend’s beach closure was partly prompted by shark spotter Greg Skomal, who said he had seen three sharks up to 18 feet long swimming near the coast, according to the Cape Cod Times. At Nauset Beach, lifeguards were on hand to prevent people from going into the water other than to get their feet wet. One woman was asked to return to shore when she was wading knee-deep in the Atlantic, according to the Cape Cod Times. A sign at the beach blamed ‘the presence of marine life in the water’ for the ban. The recent influx of sharks in the waters off Massachusetts is believed to be down to the increasing prevalence of seals in the area. “The elbow of the cape has these large, dense concentrations of grey seals now, and these white sharks go to the area to feed,” said Greg Skomal. The shark encounters will doubtless draw comparisons to Jaws, the 1975 blockbuster which was filmed on nearby Martha’s Vineyard.